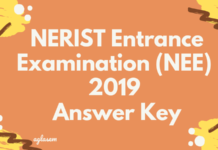 NEE Counselling 2019 – NEE Counseling/admission will start after the announcement of result. 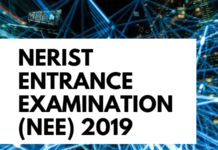 The names of the selected/waitlisted candidates, along with the date and time of counselling/admission will be uploaded on the Institute website (www.nerist.ac.in). At the time of counselling/admission, the candidates will have to produce all the relevant original certificates/documents. Further, they will have to submit attested copies of all the relevant certificates/documents at the time of counseling or admission along with the online Anti-ragging undertakings (after admission). The NEE counselling 2019 will begin, in the month of July 2019 on the basis of the performance of the candidates in NEE-2019, candidates shall be placed in the Selected, Waiting, Extended Waiting list for admission. The admission Waiting list candidate is subject to availability of vacant seat after admission from the selected candidates. The admission Extended Waiting list candidate is subject to availability of vacant seat after admission from the Waiting list candidates. Candidates can check the expected schedule for NEE counselling from the table below. Class – X, XII & Diploma Pass Certificate, migration certificate, mark-sheets of all semesters of Diploma etc. Aggregate marks for NEE-III in Diploma 3 years should be 60 % or more. SC/ST/OBC/PD certificate (if applicable) issued by the competent authority (Deputy Commissioner or an Authorized Revenue Officer) in support of your claim for selected quota. PD candidate must bring proper Medical Certificate clearly mentioning the locomotor disability and its percentage. Permanent Resident Certificate (PRC) is required if you had applied for state quota of NE Region. The certificate should be issued by the competent authority (Deputy Commissioner or an Authorized Revenue Officer) bearing the name, designation signature with date and office seat of the issuing officer. Govt. Employee Certificate of Parent/legal guardian, if applicable. Private Business Certificate, if applicable. Legal guardianship certificate/affidavit from first class magistrate with the application, if applicable. Three photographs of size 2.8 cm x 2 cm. Parent / legal guardian’s income certificate from the competent authority. You are requested to bring a medical fitness certificate as per the attached format. You are requested to bring the affidavit (Annexure – I & II) as given in the information Brochure. You are also requested to bring photocopies of all above documents attested by a Gazetted Officer. The following points are to be noted in connection with counselling. Your absence in the counselling on the prescribed date and time will be presumed that you are “Not Interested” in admission to this institute and your candidature will be forfeited for admission. With late reporting on the appointed date, you may lose your seniority for the choice of discipline and admission. Any deficiency in your documents of admission or false statements found even after our admission/registration to this institute, your admission will be canceled. Note: Providing incomplete/incorrect information will result in cancellation of the applicant’s candidature. In case of any dispute, the decision of the Director, NERIST and the Chairman, NEE, shall be final, and no claim or request in this regard shall be entertained at any stage. For admission, the candidate shall be required to bring the following amount on the date of counselling. Admission fee for Rs. 14000/- only (approx as per the last year) for Gen / OBC and Rs. 12500/- only (approx as per the last year) for SC / ST / PD in cash. Hostel fee for Rs. 10,500/- (last year) only being mess advance in the form DD in f/o Chief Warden Hostels, and Rs. 1500/- being caution money in the form of DD in favour of Chairman, HMC (State Bank of India, Nirjuli-09535). Ragging is banned in the Institute. Anyone, who is found indulging in ragging directly or indirectly during the entire period of his/her study, will be punished as per the institute bye-laws. The punishment may include actions under penal laws, expulsion from the Institute, and suspension from the Institute or fine with a public apology. It may also take the shape of (i) withholding his/her results, (ii) withholding his/her scholarships or other benefits, (iii) suspension or expulsion from hostel or mess or collective punishment, and/or (iv) mentioning the act of indulgence in ragging in his/her Conduct certificates, etc. Further, they will have to submit attested copies of all the relevant certificates/documents at the time of counselling/admission along with the online Anti-ragging undertakings (after admission). (For details of the affidavits, please refer to section 21 and appendices I and II thereof) in the Brochure.